AtlasIED is pleased to introduce the new TitanONE T112 smart mainframe power amplifier, providing the latest signal automation, processing, and amplification technologies in one modular solution. The TitanONE T112’s modular design allows up to seven TitanONE series power amplifier cards (sold separately) to be easily inserted into the mainframe. This offers twelve main channels of amplification, two backup channels for redundancy, and each channel has a complete library of DSP filter options. The TitanONE T112 is networkable offering IEDNet+ IP-based system control and digital audio transport via Dante™. The TitanONE T112 integrates IED’s world-renowned SystemAssured™ supervision for entire system monitoring and fault detection to ensure worry-free, 24/7 operation. And the TitanONE T112 doesn’t stop there; it also incorporates AtlasIED’s patented smart technology - AlwaysHEAR™. This ensures the audio levels are automatically adjusted to the perfect sound level. The TitanONE T112 offers multiple technologies in a single compact form factor, and is the perfect solution for life safety systems. The T112 meets the stringent standard requirements for life safety and mass notification systems. It is UL 864/1711 and UL 2572 listed, and it can be easily incorporated into any fire or life safety system. The T112 also can enter “Power-Save Mode” via contact closure or over the network. In this mode, all the power amplifiers are switched off unless needed for an emergency message. This saves battery or backup power supply drain - when the main power is lost. 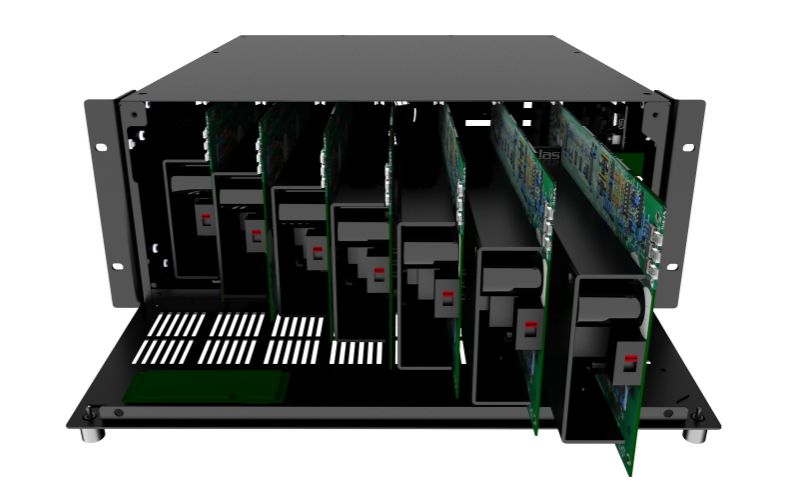 The T112 mainframe with DSP can provide up to twelve main channels of amplification and two backup channels for redundancy. Six of the amplifier cards function as primary cards to drive connected loudspeaker circuits. The seventh card functions as a redundant backup that is automatically engaged in the event of a card failure. The T112 modular mainframe can also support dual-channel line output cards T2LD-120V & T2LD-230V to drive external systems or to provide processing for self-powered loudspeaker arrays. The T112 digital signal processing provides twelve individual channels. If an amp card fails, the processing is automatically switched to the backup amplifier card. Each processing channel includes level controls, page routing, automatic ducking of background music, equalization (up to eight parametric bands per amplifier channel plus high-pass filter), signal delay, and patented technology for ambient analysis-based automatic level control. Other signal processing includes matrix mixing of available inputs and compression on analog inputs. Being fully networkable, the T112 incorporates dual 1GB network ports for primary and backup network connections. 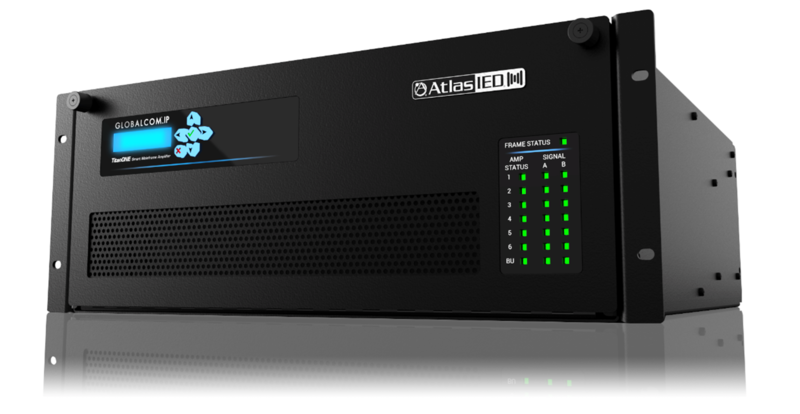 The T112 supports IEDNet+, an Ethernet-based system control protocol providing software-based routing, control, and supervision of AtlasIED devices. IEDNet+ builds on the 20+ year IEDNet control and supervision protocol with the addition of real-time IP layer 3 transport protocol. Also, the mainframe provides digital audio network connections utilizing Dante™ technology from an AtlasIED audio network controller such as a GLOBALCOM®.IP IP100 series ACS or 5400ACS announcement control system. Local program or background music (BGM) inputs can connect to analog connections located on the back of the mainframe. Patented technology for real-time control ensures announcements are heard at the perfect sound level. This AtlasIED software measurement technology automatically and continuously tests the ambient noise levels within an environment and dynamically raises or lowers the loudspeaker levels to compensate for noise changes. The T112 has connectors on the back of the chassis for up to twenty-four IED540S ambient analysis sensors. One or two sensors can be used per main amplifier channel and each ambient sensor intelligently reports the noise level at its location. The T112 mainframe uses this information to automatically compensate the individual output channel levels for optimum sound pressure performance in that specific location only. Additionally, other output channels that don’t have sensors may be slaved to a channel which does have ambient sensors.